Quite a few of these tweets linked to Felix’s story–he is, as they say, driving the conversation. Felix comes off as bearish, but the crux of his argument against Bitcoin’s efficacy misunderstands how it should be used. He applies macroeconomic theory to Bitcoin as a currency in isolation, as if the dollar suddenly vanished and monetary policy was henceforth determined not by the Federal Reserve, but by Bitcoin’s obscure mining discovery algorithm. By design, the total number of Bitcoins in circulation will max out at 21 million, and Felix points out that a constant money supply will lead to deflation–disaster. The result is an economy which would simply grind to a halt, with massive unemployment and almost no economic activity. In a word, it would be a Depression. In order to have economic growth, you need monetary growth as well — and that’s something which is impossible to achieve in a bitcoin-based system. The key difference in the Co-op case is that the scrip had a fixed exchange rate: one voucher for one hour of child care (good as gold!). Though the currency scheme might become effectively useless due to poor monetary policy, each individual piece of scrip would maintain its value. Bitcoins have no such backing; each one is worth exactly what people are willing to pay for it. So if they turn out to be completely useless as a currency, there’s no reason the price won’t collapse to zero. But Felix argues the system is flawed because BTC will be too increasingly valuable for anyone to even consider spending them. Does this sound paradoxical to you? He agrees: “The biggest problem with bitcoins . . . : if they succeed, they fail.” But since their value only comes from the fact that people trade them for goods and services, it sure seems like they would be worthless in a world where there’s no bitcoin market activity at all. The reason the BTC market cap passed $1 billion recently is that people think the system is useful. It doesn’t make sense for the fatal flaw to be that the bitcoin economy is deflationary because the coins are too precious to part with. That might be a strike against the scheme, but it certainly won’t kill it–and it doesn’t say anything about where the BTC/USD rate is likely to go next. 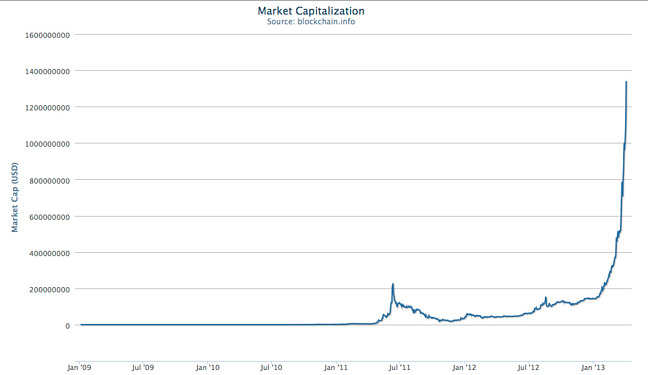 All that said, Bitcoins are obviously in a bubble right now–no asset should have a right angle in its price chart. They’re obviously due for a correction, but it’s also clear there’s too much resilience here for BTC to ever hit 0. I was a doubter during the initial runup to $30/BTC in the summer of 2011, and I thought for sure the currency scheme wouldn’t survive the bubble pop that was coming. The drawdown took away over 90% of their value, but there was enough buy-side support under $3 to keep Bitcoin alive. A proportional collapse from this week’s peaks would definitely give fits to some speculators, but it wouldn’t take the exchange rate below $10/1BTC. This entry was posted in Uncategorized and tagged Bitcoin, BTC, Felix Salmon, Medium, Mt. Gox, Twitter on April 4, 2013 by natecarroll.